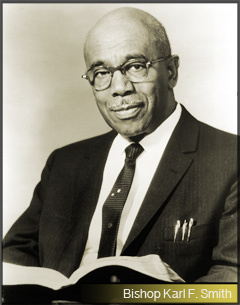 Bishop Karl F. Smith was my great grandfather on my father’s side of the family. He was an incredible presence in my young life. He died in 1972 when I was 6 years old but I remember him. I vividly remember him preaching from behind that giant pulpit. His gruffy and commanding voice and super clear way of talking. I encourage you to listen often to the incredible wisdom and clarity that God entrusted to this amazing man. Bishop Smith addresses our position as children of God. We have victory written into our futures. We must understand who we are and how that victory is realized in this world. The fact is, life is difficult. The truth is, we overcome by the blood of The Lamb and the word of our testimony. Bishop Smith begins in I Kings chapter 3 where God asks Solomon to “ask what he will”. God gives us the same ability to ask of Him what we want. The real question is. Are we careful to ask the King the right questions? It is a pity that we have such a vast power who loves us and wants to hear us ask of Him and we sometimes ask for silly, fleshly things. The Bible states that faith without works is dead. Faith requires some form of action to move the heart of God. Faith for yourself is one thing. True love and dedication to another person is truly walked out when you can apply your faith, selflessly to another’s needs. Bishop Smith looks at the men who carried the lame man to a roof top to bring him to Jesus. The Bible states that without faith it is impossible to please God. Faith is the foundation of every believer. It is also the gift of God. The grace and faith to believe in Christ Jesus. Bishop Smith shows us that the men who destroyed the roof to get their friend to Jesus operated with reckless abandon. Their faith was alive. The Bible states that ever since the fall of man, the earth has been groaning. Every man that tills the ground has an arch enemy to prevent him from his desired success. The Bible doesn’t say that we will be without trouble and toil. Bishop Smith shows us that the word says we will have trouble but we have a very present help in the time of need. It is as if this message was just preached. Bishop Smith looks at the those who are overcome, overwhelmed and feel that there is no other choice than to take their own life. The enemy of our souls would have us believe that this is the answer to all of our problems. To no longer be on this earth. God is a way maker and has all of the answers we need. He gives us perfect peace in the times of trouble. I’ve always known him as “Pop” Smith. Everyone always called him that inside of our family circles. Occasionally I would hear others call him Bishop Smith but that was too formal for me… I remember sitting on the 4th row with my mother and listening to him. I was “pampers” to him, he was “Pop” to me. All of the early recordings found here are captured from a set of reels from a gentleman somewhere in Ohio who recorded them from off the radio station WCOL sometime between the 1950’s and 60’s. In development now is the processing of some of Pop’s original library. Visit often or register to get updates. We will not share your email. Look just below this window and you will see the most current videos posted. Just click which video you would like to see. The entire archive can be visited by clicking the button below. •You may register and leave a comment if you desire. It is welcomed.